In order to study the interaction of several early visual cues (luminance, color, stereo, motion) during boundary detection in challenging natural scenes, we have built a multi-cue video dataset composed of short binocular video sequences of natural scenes using a consumer-grade Fujifilm stereo camera (Mély, Kim, McGill, Guo and Serre, 2016). We considered a variety of places (from university campuses to street scenes and parks) and seasons to minimize possible biases. We attempted to capture more challenging scenes for boundary detection by framing a few dominant objects in each shot under a variety of appearances. Representative sample keyframes are shown on the figure below. 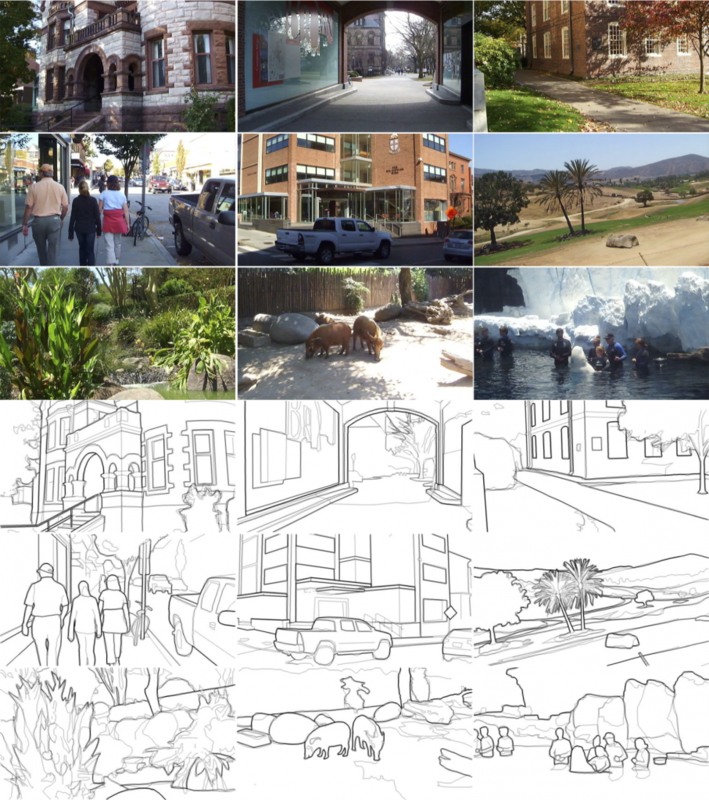 The dataset contains 100 scenes, each consisting of a left and right view short (10-frame) color sequence. Each sequence was sampled at a rate of 30 frames per second. Each frame has a resolution of 1280 by 720 pixels. A few representative frames from our dataset, along with the boundary annotations averaged across subjects. Darker lines means higher human agreement. Note that the annotated contours have been dilated for display purposes. The dataset can be downloaded here (around 3.4 GB in size).